Bathing your baby is fun and easy. You just need a few items for a successful bath, many of which you probably already have lying around the house. Some books, like The Baby Whisperer, give a very specific technique for exactly how to lower your baby into the bath… ahhnnnd it must be done * just * like * so * … nonsense! As long as the temperature is right (very warm but not burning), just slide them in! No need to over-engineer it. Assuming you have the right tub, it’s as simple as you might think. It’s very difficult to bathe a baby who is younger than 6 months old in a sink. They can’t sit on their own, so unless you have two sets of hands (one to keep baby from slipping under the suds and one to do the rub-down), I don’t recommend it. The majority of baby bath tubs are 3-in-1 tubs that serve newborns and up. These regular infant tubs are the most economical and work well for the vast majority of the population. Our favorite is the quintessential “blue tub” by The First Years ($21). There is absolutely no reason to spend any more money than this on an infant bathtub, I promise! Three to six month olds can use it in the reclined position (with newborn sling removed), and “sitters” (6+ months) can use the tub sitting upright. This tub does a nice job of “growing” with your baby (although you will probably not use it for more than a year, despite what it says on the box — just sayin’). The big downside to the blue tub (and those like it) is that it’s harder to fit into your kitchen sink and such; you see, it is MUCH easier to bathe a baby-in-a-tub without having to bend over or kneel down. Thus, you may be able to cram this into a larger kitchen sink if the geometry is right, but no guarantees. There are some smaller tubs that are easier to use on the countertop or in the sink. 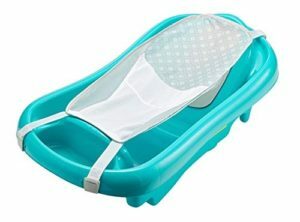 The most popular is a bucket-style tub, like the Original Tummy Tub (below), but save yourself some money and go with the more affordable WashPod by Prince Lionheart. I’ll let you in on a little secret: these are just buckets! Why put a newborn in a bucket? For starters, it feels like the womb again. Babies dig this. Also, some babies prefer to be upright vs. laid back (as they are in the sling of a 3-in-1 tub). If your baby is fussing about being laid back in a sling, I recommend giving one of these tubs a shot. 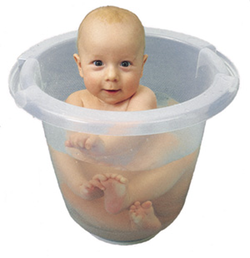 The only downside with buckets is that it’s hard to access and clean your baby’s nether regions, which usually…. let’s just say they need regular cleanings. “Can’t I just use regular adult towels and washcloths?” – Yes, absolutely. The advantage of buying baby towels and washcloths is that babies need to be washed more frequently due to (ahem) frequent accidents. Washing little towels and washcloths is simply a matter of taking up less space in your laundry — sort of like the difference between washing twin sheets and king-sized sheets. Also, most baby towels have little hoods, which are nice for toweling off hair and keeping those little heads warm. I don’t have a strong preference in this department, just get whichever ones make you happy 😉 The one pictured above is from Pottery Barn Kids and (how WASP-ey of me), it’s an awesome towel (and a great gift…). Clevamama has a cool towel that keeps mom dry, too. Very thoughtful. You’ll need some baby shampoo to clean out all those cracks and crevices. The quintessential baby shampoo is Johnson’s Baby Wash, which is great because of the “no tears” feature. Our favorite all-around baby shampoo is Mustela Foam Shampoo for Newborns. Mustela is very gentle and won’t strip the oils from their soft hair. For something a little crunchier (and if you can afford it! ), check out some of the “natural” favorites, such as Earth Mama Angel Baby Shampoo & Body Wash and California Baby Super Sensitive Shampoo & Body Wash. Personally, I would take “no-tears” soaps any day over these natural soaps that can burn baby’s eyes, but that’s just me. It’s nice to have a hand-sprayer type of shower head to wet and rinse baby’s hair and body. If you don’t have a hand sprayer, you can use a simple plastic cup (kinda like the ones you steal from the stadium after a football game). The frequency of bathing babies varies greatly from mom to mom: some do it every day and some do it once a week (yikes). The truth is, babies aren’t exactly rolling around in the dirt or getting sweaty at the gym, so you don’t need to bathe them every day. That said, they do get kinda gross from daily grime (copious amounts of spit up, errant milk, and the occasional blowout). Also, many moms find it to be a soothing and relaxing end-of-day ritual. **After you give birth, I’ll send you an issue about how to care for baby’s umbilical cord. That’s all she wrote. See you next week! Keep it cool, fool.